Canada lost to Portugal in the countries first loss since the founding of the United Nations. With every set back in life there is often a silver lining which, if properly investigated and appreciated, one can use to adjust circumstances to one’s benefit. The current debate in Canada with regard to losing its bid for a non-permanent seat on the United Nations Security Council provides just such an opportunity. Many reasons for Canada’s international rebuttal have been put forward by numerous pundits from around the political spectrum. I will cover some of the more pertinent issues. Patrick Goodenough has documented the growing strength of the Organization of the Islamic Conference (OIC) at the UN, which is a concern for the democratic world, especially in terms of the UN Human Right Council (HRC). The OIC holds 56 seats in the UN General Assembly and 18 of 47 seats at the HRC. The group generally votes as a bloc on issues that concern Islamic governments, including the Israeli-Palestinian conflict and the defamation of religion movement. Canada has often found itself on the opposite side of the Islamic bloc, writes Goodenough. And in many circumstances with good reason. To a large extent Harper should be praised for standing firm to Western democratic principles. But in other areas, his position seems rigid and unconcerned with the complexities involved. Everyone has the right to hold opinions without interference and the right to freedom of expression, the exercise of which carries with it special duties and responsibilities and may therefore be subject to limitations… necessary for respect of the rights or reputations of others, protection of national security or of public order, public health or morals and general welfare. This declaration has many potential detrimental consequences for freedom of expression. Defamation of religion is by no means a justification for states to subject individual freedom of expression to limitations. Canada and Harper are right to oppose the OIC and its supporters on this issue. Whatever your political leanings may be, if you consider certain actions of the Israeli government to be without need of reprieve – continued settlement expansion on occupied land without regard for international law, the lack of recognition of civilians in a war zone, a lack of sincerity in the peace process – you are most likely a proponent of “my friend can do no wrong” position. The Israeli daily Haaretz reported that under the current conservative government Canada abandoned its traditional multilateral diplomacy – an apparent “weak-nation strategy” to Harper – and embraced Israel while cooling relations with the Palestinian Authority. 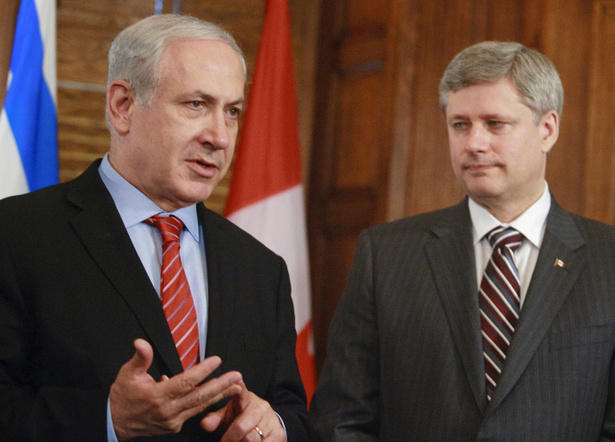 Prime Minister Stephen Harper, here with Prime Minister Benjamin Netanyahu, has become an unwavering supporter of Israel. After the victorious election of Hamas in the Palestinian parliament, Canada’s government severed all relations with the group and cut off its $7 million annual financial assistance to the Palestinian Authority. And in January 2010, Canada stood alone in reducing financial contributions to the UN Relief and Works Agency which provides education, health care and emergency aid to Palestinian refugees in the West Bank and Gaza, effectively removing a reported $18 million from the agencies coffers. KAIROS signed onto a campaign that specifically targeted Israeli goods, services and companies that were produced in, originated from or had set up shop in the occupied territories. 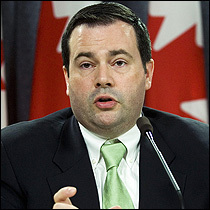 [Immigration Minister Jason Kenney] suggested he considered the difference a matter of playing semantics. But does anything close to a “viable Palestinian state” exist? Is Israel allowing it to be created? Growing Jewish-only settlements, Israeli bypass roads and the apartheid barrier all make a Palestinian state far from realistic in the short to medium term. Yet Canadian officials act as if Israel is working toward a Palestinian state. Israel is indeed a friend and ally of Canada, and should be supported as a democratic state amoung largely nefarious regimes. 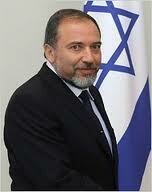 But as with most friendly and allied nations Israel is not always right, just as the Palestinians are not always wrong. Both groups deserve our support for noble actions and justified reprieve for immoral actions. An inability to recognize the difference between positive and negative actions by the government of Israel, or the difference between legitimate Palestinian aspirations and those of extremist organizations such as Hamas does not serve Canada or the world well. The most interesting justification the Harper government has come up with to deflect the obstacle and so miss the opportunity to embrace a silver lining: blame the opposition leader. “This is a government that for four years has basically ignored the United Nations and now is suddenly showing up saying, ‘Hey, put us on the council.’” That was the gist Opposition Leader Michael Ignatieff’s position. And in considering what to think about the international snub given to Canada, Mr. Ignatieff wants Canadians to ask themselves the question that members of the Harper government seem to be ignoring: Has this government earned that seat? Well, has it? 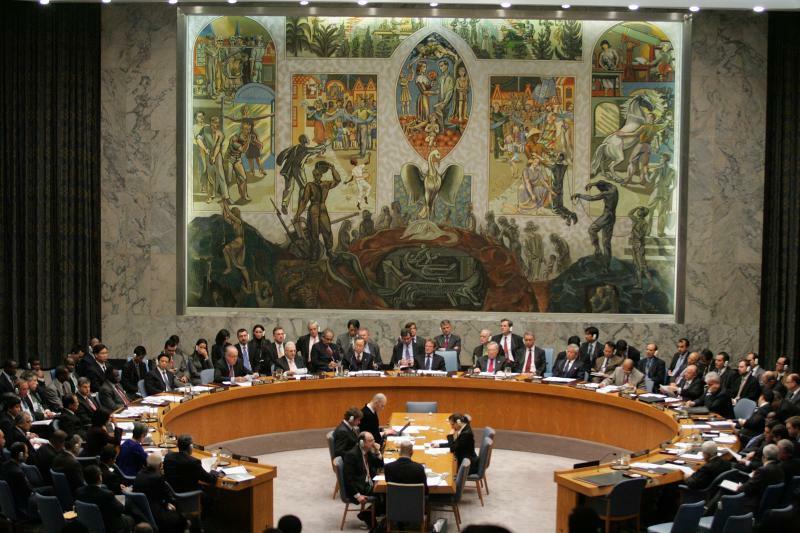 To win a seat at the UN Security Council it is generally understood that a nation should be a multilateral player, should be engaged in discussions of international concern, should have a foreign policy vision that resonates with other world actors, and should employ its resources as a leader in effectively combating global challenges. Harper has ignored Canada’s previously cherished role as an effective multilateral world player, a foreign policy position which allowed former foreign minister Lloyd Axworthy’s focus on human security to take center stage at the international level. 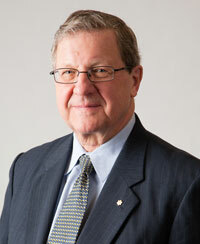 The human security agenda advanced by Axworthy ambitiously targeted a range of international endeavours which all aimed at securing human well-being. Under Axworthy’s leadership Canada was able to effectively push what has been coined the Axworthy doctrine, which holds that weaker states and non-state actors (global civil society) are capable of advancing a human security agenda on their own. This gave rise to the belief that a human security agenda could be pursued without securing great power cooperation through bargaining and compromise. The doctrine further asserts that the state-centered international system is being replaced by a norm-centered system where states’ freedom of action and ability to maximize their self-interest are increasingly constrained by normative principles . By pushing this doctrine, Axworthy believes that the community of states can move beyond the Hobbesian nature of the international system, where might has for centuries equalled right. Canada’s ability to achieve progress with a human security rather than a “muscular” approach is contingent more on its possession of soft power than hard power assets. Soft power and reliance on like-minded nations and non-governmental organizations are the primary instruments of this approach. This, if one realistically considers Canada’s international position, is an enlightened method that can and has served a middle power such as Canada well in the past (See: Ottawa Process and Responsibility to Protect). The problem in this case is not the method, but the nature of Canada’s ambition. In the past, this country has sought and won seats on the Security Council as a means to something: an approach to peacekeeping, a nuclear-arms-control drive, a post-Cold War reconciliation. This time, many international observers feel that the tail is wagging the dog. It looks to many as if Canada is using its few actions in the world – our big sacrifice in Kandahar, our outspoken commitment to the prosecution of Sudanese leaders – as pretexts for our aspiration to prominence in international institutions. Beyond that goal, our foreign policy seems to be one-dimensional and withdrawn. Responsibility for Canada’s lose of the UN Security Council seat rests on the shoulders of the Canadian government. Those that have attempted to deflect this responsibility by justifying their “principled” rather than popular foreign policy approach are doing themselves and Canada a disservice. Hopefully there is some soul-searching going on behind doors, because the current attempts at saving face do not reflect the potential for a silver lining to this debacle. A complete overhaul of the Harper government’s foreign policy, as some have called for, is not necessary. But changes should be made. Specifically, acknowledging Canada’s middle power position and what methods have been successful in the past should be a guide to future, and current, leaders. Talk of a principled foreign policy approach is good and great. But when those principles are either not defined, lacking sincerity, or largely ineffective in achieving the desired objectives, defending the status quo is bad policy. Stephen Harper should take note. I think the general consensus is that the peace process cannot begin until illegally annexed Palestinian lands are returned and a full Israeli withdrawn conceded to pre-1967 borders, yet it seems like if a person mentions any sort of wrong doing by Israel, that person gets labeled anti-Israeli, anti-semite. I had this occur the other day when I was chatting with someone about the Israeli-Palestinian conflict. He was spouting the history of the region, terrorists groups, Israel’s need for security.. but when affronted by the human rights abuses that Israel is responsible for, or the fact that they are occupying another land.. suddenly there were those ‘labels’. As far as he was concerned there was ‘no solution’ to the problem in the region; That the peace process was a lost cause. Does the right now represent the lowest common denominator? Canada used to be so well balanced, but now is slowly turning into the USA. Harper has to go, and after he does we need an elected senate, and electoral reform. I’m not a fan of ‘the Harper Administration’, I can’t wait to vote him out of office. This was an excellently written piece, I found it quite interesting. Hey Andrew, thanks for the comment. While you are right that many are quick to reply to criticism of the Israeli government by playing the anti-semite card, it is also true that Israel is very often unjustly criticized for its actions. There is indeed a fine line in many international institutions that often becomes blurred in terms of justified criticism of the Israeli government and anti-semitism.